AEG’s Season of Giving hosted the Starlight Children's Foundation & Disney On Ice at the LA Kings Holiday Ice at L.A. LIVE last week. 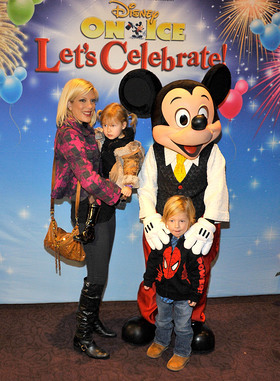 Starlight children were joined by Disney characters and celebrity friends, including Lauren Conrad, Tori Spelling, Billy Bob Thornton and Mark-Paul Gosselaar for an evening full of ice-skating and holiday festivities. Starlight Children’s Foundation ambassadors Kyle and Chris Massey took the center of the ice rink and rallied the crowd gathered at L.A. LIVE to pick up their phones and text-to-give to the important work of the organization. Other stars who attended included Alison Sweeney and Molly Ringwald. When a child or teenager has a serious medical condition, everyone in the family is affected. For more than 25 years, Starlight Children’s Foundation has been dedicated to helping seriously ill children and their families cope with their pain, fear and isolation through entertainment, education and family activities. Starlight’s programs have been proven to distract children from their pain, help them better understand and manage their illnesses, and connect families facing similar challenges so that no one feels alone. Through a network of chapters and offices, Starlight provides ongoing support to children, parents and siblings in all U.S. states and Canadian provinces with an array of outpatient, hospital-based and Web offerings. Programs are also delivered internationally through affiliates in Australia, Japan and the United Kingdom.